Litigation & Dispute Resolution Practice - MOLITOR Avocats à la Cour. Response times, especially at critical moments, are excellent. MOLITOR retain their reputation in the latest editions of the main legal directories as one of the top dispute resolution firms in Luxembourg. The firm has built a very solid reputation in complex commercial litigation and other dispute resolution procedures with cross-border aspects. The dispute resolution team specialises in highly complex court cases and behind the scenes negotiations. Michel Molitor has contributed the Luxembourg Chapter of LBR’s Dispute Resolution Review 2017. 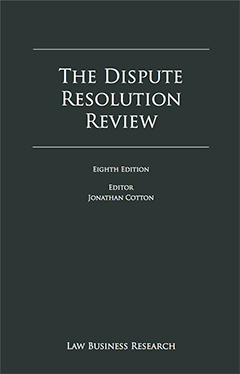 This ninth edition covers 40 jurisdictions and provides key aspects of each jurisdiction’s dispute resolution rules and practices. The Dispute Resolution Review provides an indispensable overview of the civil court systems of 45 jurisdictions. In a world where commercial disputes frequently cross international boundaries, it is inevitable that clients and practitioners across the globe will need to look for guidance beyond their home jurisdictions. The Dispute Resolution Review covers 48 countries and territories. Disputes have never respected national boundaries and the continued globalisation of business in the 21st century means that it is more important than ever before that clients and lawyers look beyond the horizon of their home jurisdiction.